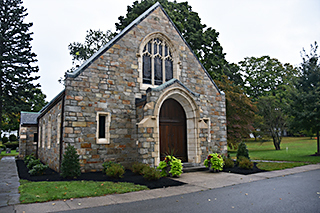 We welcome you to donate by mail to the Gilman Chapel Restoration Fund. Your support for the second phase of the restoration project is crucial to the success of this wonderful project to restore the Gilman Chapel to its original beauty and for its preservation for future generations. The Trustees of Cedar Grove Cemetery ask for your help in making this restoration project a success. To make your donation by mail, kindly download the Donation Form using the button below. When you download the form, you will be able to view it online. Print out the form and fill it out by hand. This is your best option if your Internet Browser does not support filling of form fields. Fill out the form on your computer (or Open with a Different Viewer to fill it out), and print it out. Save the form to your computer, open it with Adobe Acrobat, fill it out on your computer, and print it out. AND WE THANK YOU FOR YOUR SUPPORT!